What is the ultimate question? And, what is it's answer? We asked this question on our television show Christ in Prophecy of Carl Gallups, senior pastor of Hickory Hammock Baptist Church in Milton, Florida, and the author of the best-selling apologetics book, The Magic Man in the Sky. He is also the founder of the world famous PPSIMMONS YouTube channel and prominent Freedom Friday radio talk show host. Nathan Jones: Pastor Gallups, the last chapter in your book is called, "The Ultimate Question." What is the ultimate question? 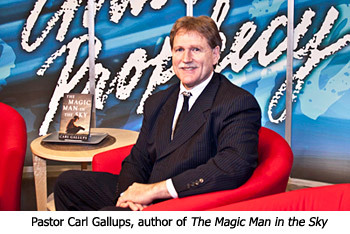 Carl Gallups: The book to me would not have been worth writing if it didn't end with this presentation. The ultimate question can be stated in many ways, but it goes something like this: "If you were to die today, where would you spend eternity?" There are other ways to state that, but that would be the ultimate question. Where one spends eternity is the ultimate question of life, because we know that this life is limited. We have 60, 70, 80, or maybe 90 years if we're blessed. And, then what? Well, the Word of God tells us what. Of course, my book is written to prove that the Bible is the Word of God, that there is a God, and that He is the Creator. There is something beyond this "fish pond." So the ultimate question can be restated, "When you leave this fish pond, where are you going from there?" How do we get there? We know of course through the Word of God that eternal life is offered only through a born again relationship in Jesus Christ. What you need to do to become born again and become part of the family of God is as Romans 10:9 says succinctly, "If you would confess with your mouth that Jesus Christ is Lord, and believe in your heart that God raised Him from the dead, you shall be saved." Romans 10:13 promises, "And for whosoever shall call upon the name of the Lord shall be saved." The Gospel message is very clear, very succinct, and very plain about this — you must understand that there is a God and Jesus is God. He created you on purpose with a purpose. You're not a souped-up gorilla. You didn't get here accidently. There is purpose, meaning, worth and dignity for your life. You can spend your eternity with Him, or apart from Him. Because we have a sin nature, there must be a provision for our salvation. God made that provision in Jesus Christ. That if you will repent of your sin and call upon Jesus as Lord, asking Him to save you, God says in His Word again Romans 10:13, "For whosoever will call upon the name of the Lord shall be saved." Confess with your mouth, believe in your heart, and God will save you.